Without treatment scapholunate advanced collapse and wrist arthritis forms. 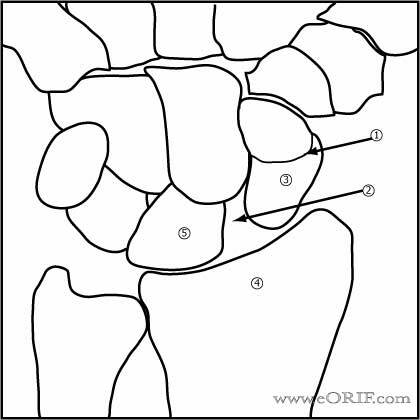 Extrinsic wrist ligaments-extracapsular from radius to carpal or metacarpal. wrist pain after a fall on the outstretched pronated hand with wrist in extension, ulnar deviation and carpal suppination. Vigorous hand grasp causes wrist pain. Standard views may not demonstrate scapholunatue widening. Allows consider PA Clenched first view. 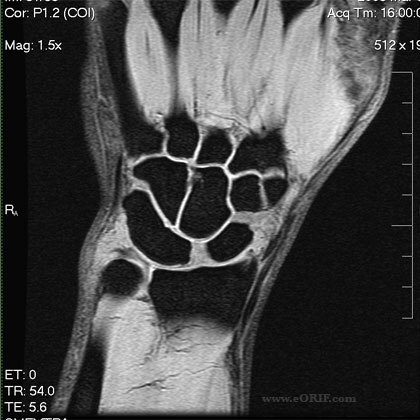 Lateral radiographs may show the scapholunate angle to be increased beyond 60°. >80° confirms SL instability. Normal scapholunate angle=47 range=30-60 degrees. Radiographic findings: PA radiograph, the scaphoid appears foreshortened, has a “cortical ring” sign(volar flexed scaphoid distal pole seen in cross section) and there is a scapholunate gap of greater than 3 mm. Scapholunate gap >5mm confirms scapholunate interosseous ligament disruption. Terry Thomas sign = enlarged scapholuante gap. Lunate may also appear triangular (should be quadrilateral in shape). PA clenched fist view in ulnar deviation accentuates widenings at the scapholunate interval. 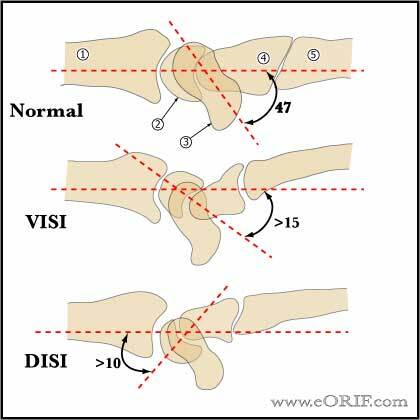 Comparision views of the uninjury wrist are generally indicated. Acute (<4wks): Scapholunate ligamentous repair vs arthroscopy with ligament insertion site debribement to bleeding bone and scapholunate k-wire pinning (Whipple TL, Hand Clin 1995;11:37). Lunotriquetral Coalition: a wide scapholunate gap can be a normal variant in patients with lunotriquetral coalitions.